Cool travel destinations, ideas, and tips and tricks. Besides sports and snow, the Midwest is king in beer. With new breweries popping up every day, the Midwest has claim on some of the best beers in the nation. As a brewer’s wife, I have had my fair share of hoppy, malty, delicious beverages, and I’ve gathered for you a few of my favorite must-see breweries. The great thing about the breweries listed here is that they all can and distribute, and you should be able to find most of these at your local liquor store…but nothing quite beats getting a fresh beer at the tap room! You could easily hit up all of these on an epic beer-cation (we did 3 Floyds, Founders, New Glarus, and New Holland in one trip), or make a short weekend of it and visit a couple breweries in a given region. Ale Asylum and New Glarus are somewhat close to each other, as are Revolution and Half Acre. Founders and New Holland are a short drive from each other and 3 Floyds is easily reached in a few hours from Chicago. And if you decide to travel to any of these breweries, do yourself a favor and take a tour! The New Glarus Hard Hat Tour is well worth the $30…and the tour at Revolution will excite beer nerds of all kinds. Most also offer food, so gather up your friends, jump in the car, and enjoy a beautiful summer day at one of these fine Midwest brewpubs! Tours: Brewery Tours are offered Saturdays, Sundays, Wednesdays, and Fridays. Founders also offers a dinner series, beer tastings, and classes in beer making and evaluating. If you’re making a trip out to the Founders Brewery, do yourself a favor and go on a guided tour. See how the beer is made, packaged, and promoted in their amazing state-of-the-art facility. There’s also stunning artwork that decorates their workspace, including beer bottle chandeliers and living wall art made of hops. After your tour, stop into the Founders taproom (it’s beautiful!) and have a snack and a tasty libation. Tours: Brewery Tours are offered Saturdays, Sundays, and Wednesdays. You can also organize private tours for groups up to 30 people. A Chicago favorite, Revolution Brewing is a popular hang out for locals. A huge taproom make this a great place for parties and gatherings, and beer is almost on a constant rotation so there’s new stuff quite often. It was also the filming location for the 2013 movie, Drinking Buddies. With several award-winning brews and an awesome location to boot, Revolution Brewing is a must-see brewery for hop heads. Tours: New Glarus offers free self-guided tours during operation hours. For the real deal though, sign up for the Hard Hat Tour, a near 3-hour behind-the-scenes tour of this amazing world-class brewery. The Hard Hat Tour fills up fast though, since it’s only offered on Fridays…so plan ahead. If you can get tickets, believe me, it’s well worth it! Food Served: No. But you can take your beer out to the hop garden and enjoy a lovely view of New Glarus. I have been to this brewery several times and it still amazes me every time we visit. Besides the fact that the beer is probably some of the best in the country, the brewery itself looks like it was dropped into Wisconsin straight out of Germany. With lovely scenic views and a facility that is sure to impress, a visit to New Glarus Brewing is well worth the trip this summer! Tours: Brewery Tours are offered on Saturdays. A true treasure in Munster, 3 Floyds is, in a word, eclectic. Their brewpub is tiny and they don’t accept reservations, so plan ahead if you’re on a tight schedule. However, their food is some of the best I’ve had in a while and well worth the wait. If you need to grab and go, you can visit the Beer To Go station and grab your favorite brews that may be hard to find at liquor stores. 3 Floyds also hosts the infamous Dark Lord Day, a one-day festival that is the golden ticket for many beer enthusiasts. Tours: Brewery Tours are offered every Saturday. A small fee gets you in the tour, three beer samples, and a pint glass. With two facilities in Chicago, Half Acre is quickly expanding and growing into a popular location for beer fans. A recent decision to offer food at the brewery has helped increase foot traffic, especially in the summer months. Not unlike other breweries, Half Acre also offers beers you can only get at the taproom, including Space, one of the best IPA’s I’ve ever had. Tours: Brewery Tours are offered every Sunday. Includes a special sampling and a free pint of your choice. One of many breweries in Madison, Ale Asylum is a favorite for hop heads and chips and salsa fans. Strong and bold IPA’s and tasty late-night snacks make this a favorite hang out for visitors and locals alike. When you’re done there, head on down the street to Karben4 Brewing, another great brew pub pumping out tasty Wisconsin brews. Tours: Joint tours of the brewery and distillery are offered every Saturday. A nice brewpub in a sweet little town, New Holland Brewing offers good drinks and good food. Located in the sweet and quaint town of Holland, MI, this large-scale brewery produces beers that are big in flavor. With seasonal offerings and beers to appeal to more refined tastes (session beers, high gravity beers, barrel aged, and funky and sour beers, for example), this brewpub aims to challenge the pallet and present new and unique flavors on an ever-growing beer list. From the east to the west, the coast to the coast, here are 12 of the weirdest, wackiest, and best museums in the US! Dedicated to the history of man’s first tool, the Hammer Museum houses roughly 1,500 hammers, dating back to the cave man days. The Museum of Miniatures features 300 miniature houses and room boxes, as well as other collectables. This museum also houses the country’s oldest mini house, created in 1775. Featuring 2,000 variations of wire, this museum gives visitors an inside look at fencing, wire tools, and historical memorabilia. And with two giant spheres of barbed wire greeting visitors on the way in, this is one museum where you want to tread carefully. Yup, it’s just what it sounds like. Salt n’ pepper shakers, hangers, ties, staplers, candles, toys, harmonicas, cookie jars, ash trays, squirt guns, videos and so much more…all banana themed! There are so many things in this museum that you’re sure to find something new each time you’re there. There is a certain beauty in death, and the Morbid Anatomy Museum prides itself on finding it. Medical journals, embryological models, natural history specimens, and more are housed here, and a variety of exhibits keep the morbidly minded coming back time and again. Clean freaks rejoice! The Vacuum Museum is home to more than 600 vacuums, all in working condition. Starting in the early 1900s and working up to today, this museum even houses some celebrity vacuums, too! Crowned America’s finest museum of medical history, the Mutter Museum contains preserved collections of anatomical specimens, medical instruments, and medical oddities. Popular artifacts include Dr. Joseph Hyrtl’s human skull collection, jaw tumor of President Grover Cleveland, and Einstein’s brain. I’m not a huge circus person, but this museum is awesome! Located on the site of the original Ringling Bros. Circus, this museum features wagons and vehicles from international circuses and also puts on a show here and there for the kids. One of America’s only homegrown instruments, the kazoo has a history beginning in the 1800s. With nearly 200 kazoos on display, the Kazoo Museum is a fascinating adventure for kids and adults alike. One of man’s oldest traditions is celebrated at the National Museum of Funeral History. Discover what funerals are like for Popes, explore the amazing cultural traditions of De Los Muertos, learn about various embalming techniques, visit Presidential funerals, and check out the amazing collections of coffins, caskets, and hearses. Wisconsinites know their mustard. With more than 5,600 mustards from all 50 states and more than 70 countries, this one-of-a-kind museum is truly the king of condiments. Founded by a former hair dresser, Leila’s Hair Museum features an impressive collection of part pieces made entirely from human hair. Jewelry, wreaths, and brooches make up the majority of the collection, and visitors can also see rare collectables with locks of celebrities’ hair. Featuring 130 historic pieces, the Dog Collar Museum has artifacts dating back to the late 15th century. Thousands of strands of hair lines the walls of this museum…most accompanied by notes and images. In fact, visitors are encouraged to add a few strands of their own hair to the expansive collection before leaving. With models dating back to 25,000 B.C.E., the Sulabh International Museum of Toilets is truly a wonder to behold. Just make sure you know which ones work! Explore once-used torture devices on display at the Museum of Medieval Torture Instruments, accompanied by historical engravings of real-life events. This museum is dedicated to all things penile. With more than 215 members standing erect, this museum is truly one-of-a-kind. Revolving around the concept of failed relationships and their ruins, this museum houses rings, clothing, Valentine’s Day gifts, and many more. Once school was out for the summer for my siblings and myself, my dad would pile the family in the car and drive us up to the Milwaukee Zoo at least 3 or 4 times a month. We’d pack a picnic, fill the car with all my dad’s favorite Tom Waits albums, and spend the day walking around the zoo, taking pictures, going to various animal shows, and chasing the peacocks and geese around the premises. In the winter we’d head up for the Zoo Lights, a tradition several zoos have adopted around the holiday time, and even got to tour the zoo on those swanky “Members Only” days. My family loved our zoo trips, and if you’re looking for a fun activity to do with your kids or your friends this summer, a zoo getaway is a great idea! Several zoos now cater to adults, hosting after hour parties with food and drink, and some even offer the opportunity to camp at the zoo overnight! Rated America’s No. 1 zoo by TripAdvisor.com in 2008 and Top Zoo in the Country the following year, the Memphis Zoo is home to more than 3,500 animals, representing more than 500 different species. It’s one of the only four zoos in the country to exhibit giant pandas and is home to giant pandas Ya Ya and Le Le. A daily schedule keeps visitors on task and occupied, highlighting a multitude of feeding times, discussions, and stage shows. Plus, their website is pretty awesome! The St. Louis Zoo stands out for its commitment to sustainable preservation of animals and natural, humane exhibits. Visit Sea Lion Sound, the Insectarium, the Bird House, or visit Kali, an 850-pound polar bear who makes his home in a $16 million, 40,000 square-foot environment. Wanna get a little closer to the action? Book a behind-the-scenes tour! A trip to the Houston Zoo is so much more than animal observation. With attractions like a Wildlife Carousel and a water park, this zoo is fun for the whole family. With webcams to view gorillas, elephants, flamingos, giraffes and more, the Houston Zoo brings visitors right up to the front lines. A dinosaur exhibit and an area where kids can feed the giraffes also help make the Houston Zoo a great destination. Take a trip to the Skyfari Aerial Tram to glide over this animal kingdom and get a lay of the land. Home to more than 3,700 animals, the San Diego Zoo is a popular attraction for locals and tourists alike. Besides animals, the San Diego Zoo is also home to more than 700,000 exotic plants. A wildlife refuge that is at the forefront of environmental protection, the San Diego Zoo is making strides to keep animals safe and healthy. If you’re feeling adventurous, be sure to go on one of their many safari rides to get up close and personal with all kinds of wildlife! Embark on a tropical adventure at Zoo Miami! The great thing about this zoo is that it offers the extremely rare opportunity to feed Jaunpar and Suru, to male Indian rhinos, for just under $5.00. Visitors can also feed tropical parrots, take camel rides, feed the giraffes, and visit the waterpark and playground. Ranked as one of the largest metropolitan zoos in the world, the Bronx Zoo stretches for 265 acres and is home to an astounding 6,000 animals. Popular exhibits include a 4-D movie experience, the snow leopard exhibit, and peaceful Butterfly Garden. Operated by the Chicago Zoological Society, the Brookfield Zoo is home to all kinds of fun animals. The Brookfield Zoo has also been recognized by the Association of Zoos and Aquariums for its outstanding educational programs and events. There is a recycling drop-off center, a tree planting event, adult classes and lectures, and backstage adventures for the whole family. Located in Nebraska, this zoo features an aquarium, IMAX theater, driveable (or hikeable) wildlife safari park, the world’s largest indoor desert environment and the country’s largest indoor rainforest. Get up close and personal with desert dwellers in the Desert Dome or relax with nature in the butterfly exhibit. No stranger to top 10 lists, the Cincinnati Zoo prides itself on great programs for visitors. Nocturnal Adventures lets families pitch a tent and camp out at the zoo, and the Spaulding Children’s Zoo lets kids get up close and personal with the zoo’s newest arrivals. It is also home to events like Zoo La La, Wild About Wine, and Zoo Brew, a collection of fun evenings for adults to come and enjoy some beverages without worrying about the kids. My family never went camping. We never went to theme parks or beaches. We never took cruises or flew to far off exotic locations. Nope, my family was a road trip family. Every summer we’d all pack up in my dad’s Toyota Camry, fill the trunk with luggage and snacks, and head out on an adventure to find weird abandoned cemeteries, strange historical markers, and our favorite, the World’s Largest things. I don’t know what the magic was about us finding and seeing the World’s Largest Indian, Ketchup Bottle, Can of Beans, Ball of Yarn, or Penny, among so many others, but we loved it. As is often the case with traveling, it was really about the journey, not the destination, but knowing that the largest turkey in the world was waiting for us at the end of our road trip to Minnesota, well, somehow that made it all the more fun. If you’re thinking of taking a road trip this summer, I highly suggest you go off the beaten path a little bit and check out these ridiculous roadside attractions. There’s at least one in every state, so no excuses! What other attractions are out there? Let me know where we should travel next in the comments below! So let’s plan a road trip, shall we? I know today is supposed to be a creative day; however, my lobster craft didn’t quite work out for me yesterday…so I’m going to try it again tonight and hopefully will have something for you tomorrow. 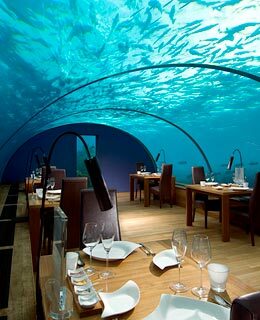 Topping the list is the Ithaa Undersea Restaurant in Maldives. Set 16 feet below the surface of the Indian Ocean, Ithaa gives diners a million dollar view of life in the ocean. Enjoy a lobster salad or their signature dish: “Crab tower with thin ciabatta and truffle mayonnaise and Maldivian banana and chili mascarpone with cream with crushed basil”. The Union Oyster House, located in Boston, is America’s oldest restaurant…possibly serving the likes of America’s Founding Fathers. 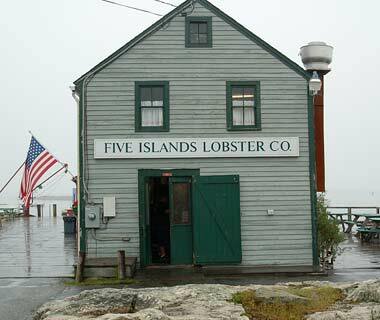 While this cozy little establishment is known for their oysters, you can also get lobster here…fresh from the coast. My parents visited this location as well and, while neither are fans of oysters, they said the rest of the food was delicious. 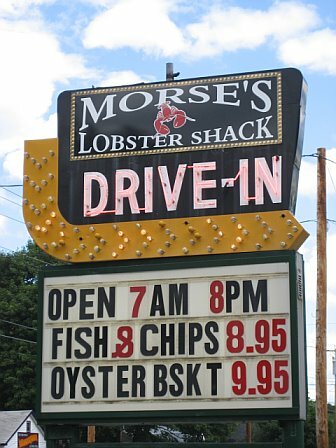 If you’re looking for delicious lobster on the cheap, head out to Morse’s Lobster Shack in Maine. It’s a bit of a dive, but the locals are CRAZY about it. Universal recommendation: try the lobster rolls. Pie and Lobster? YES PLEASE! 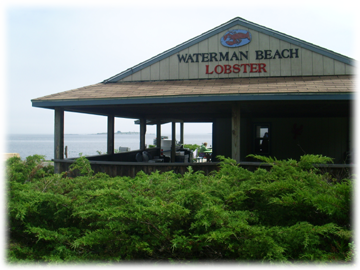 I have to say that Waterman Beach Lobster is THE place to go if you’re looking for delicious fresh lobster in the US. Winner of the prestigious James Beard Restaurant Award, this local hub serves some of the best lobsters (and pies!) Maine has to offer. 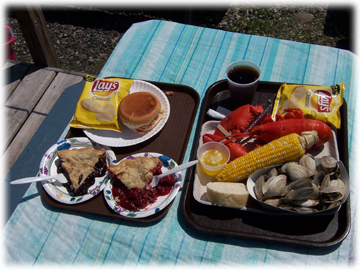 I couldn’t resist showing you this picture of some of their famous plates…hungry yet?